Are you looking for ways to motivate customers to take action with paperless billing enrollment, wellness program participation and customer loyalty to name just a few? A good amount of recent motivational behavior research shows that simplistic incentive structures do not work very well if a creative or complex outcome is desired. However, straightforward “if/then” rewards (if you do this, then you get that) perform extremely well in situations where a simple set of rules and a clear destination exists. If/then rewards narrow focus and concentrate an individual’s mind in a linear direction. While this focus has been found to be not productive for creative problem solving and where complex motivations are at play, it is ideal for insurance carriers wishing to motivate customer behaviors they desire. 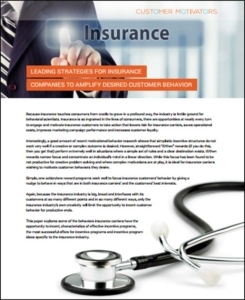 Simple, one action/one reward programs work well to focus insurance customers’ behavior by giving a nudge to behave in ways that are in both the insurance carriers’ and the customers’ best interests.